The seven deadly sins (for those who don't concern themselves with such things and/or have never seen that creepy Brad Pitt movie) are, in no particular order: wrath, envy, greed, gluttony, sloth, lust and pride. The maps originally were created in 2009, but recently popped up again thanks to a blog at memolition. 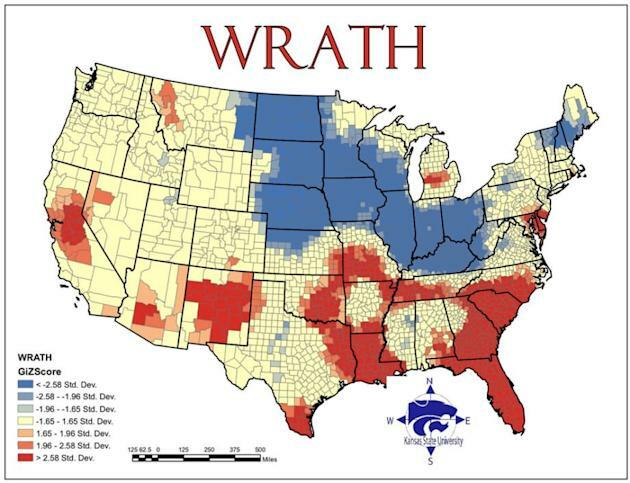 Here are a few examples, starting with wrath. Red indicates higher rates of violent crimes per capita. Blue indicates lower rates. The southeast and central California look particularly bad. Those seeking a peaceful (if chilly) life would do well to move to North Dakota. Here's gluttony. Researchers looked at the number of fast food restaurants per capita. Love cheap burgers? Virgina and North Carolina are apparently the places to be. Perhaps most interesting is the map on greed, which compares average incomes with the number of people living below the poverty line. Click here for more sinful maps as well as information on the methodology.